With all the writings and publicity regarding players clubs, it is the sad truth at least 50 percent of casinos customers (especially on the Las Vegas Strip) do not know what a club is, or due to a misconception, do not choose to join. So let’s start at the beginning trying to answer the most important question that (I assume) a non-players-club member (or a recent member) may have. What is a Players Club? A players club (aka players club or whatever name the casino marketing gurus have dreamed up) is the system a casino uses to identify their players (who is playing their machines, what machine they are playing, how long they are playing their machines and how much money they are wagering) and reward (cash, free play, rooms, food, entertainment, gifts). The rewards may be issued that same trip, or for a subsequent trip. How does a Players Club reward players? All players are issued a players club card when they sign up at the players club booth (or the promotions booth). Membership is always free. When the member begins to play he inserts the card into a special reader built right into the machine. Through an electronic tracking system, all his coin-in (total amount wagered) is recorded into the club’s central computer. In most cases the members earns points on his card based upon how much he plays (one point for every dollar wagered, or one point for every $10 wagered). Those points can then be redeemed for cash or comps (see below). Some systems do not award points. For example, Harrah’s Total Rewards uses the term “Reward Credits.” Other casinos just tell you that the card is accepted and then tell you later (at the machine, kiosk or at the booth) what you are entitled to. What about at the tables? 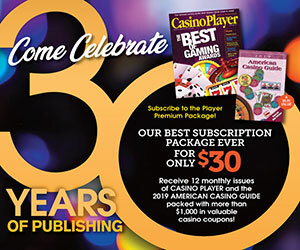 While table play is now generally lumped into a players club account for purposes of issuing comps and direct mail offers, few casinos award direct points for table games and I know of none that currently give table players cashback. A table player should still join the club, and then show his card when he buys in. Don’t these clubs mainly tell the casino who is really winning or losing? Included in the information sent to the computer is a player’s won/loss results, but this information is secondary. Short-term results are meaningless because in the long run, the casino almost always wins in the end—unless you are a trained professional player. What the casino is mainly “tracking” is how much you play. Where did the Players club idea start? Players clubs were conceived in the early 1980s in Atlantic City—the country’s first “local market” gaming jurisdiction. Unlike the Las Vegas Strip (where most of the business is sleeping in the hotel for three to five days), most Atlantic City customers go home every night. True, some of those locals travel 150 miles both ways to get there, but they only stay a few hours and the vast majority of them play slots. There was also one other factor. When the Las Vegas Strip first opened, most of the casinos were well isolated from each other by a lot of desert (there were no sidewalks then, moveable or otherwise, so you could not walk on a whim from one to the other). However, with the Atlantic City Boardwalk, it was very easy to leave one casino and go play the same game down the Boardwalk. Casino executives had to come up with a method to identify and reward their slot players so they would stay and play only in their casino. The first club (at the Sands) consisted of the executives giving special pins to their best players (based on observation) so that various members of the staff would give these folks extra special service. A few months later the Atlantic City Golden Nugget (now the Atlantic City Hilton) created the first system (using players club cards and tickets) that actually gave rewards totally based on actual play. Now, almost every casino in the country with more than 500 machines has a players club. Someone on the airplane to Las Vegas told me if I use a card I won’t win! 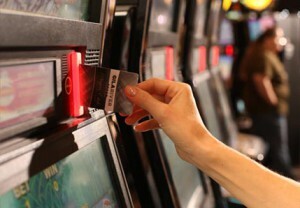 A slot machine’s payout is determined by several factors COMPLETELY INDEPENDENT of the card reader. In other words, the machine does not know if you are using a card or not, so it will pay out (or not pay out) no matter what. But even it if was possible for the machine’s computer to know if you were using your card, no right-minded executive would want to penalize anyone using a players club card. Members of the club tend to be steady customers (who tend to put jackpot money back into the machine), while most non-member players are just tourist passing through. Don’t you have to play a lot of money to get any rewards? Players clubs are designed to reward steady small-time players. If I play only four hours of quarter play every month (not exactly a big time player), I would probably earn enough at the end of the year to get $100 in “cashback” plus a couple of free meals in the coffee shop or buffet and other goodies in the mailbox. Most new players overestimate the amount of time required to earn a certain number of points. They see that it takes 2500 points to get a lunch buffet and figure that it will take them a year to earn them. In reality (assuming that the club gives one point for every dollar played) a five-coin quarter player would earn their reward in about three to four hours, and a five-coin dollar player needs about 50 minutes. Cashback is same-day cash rebates based on the number of points I redeem at the booth from my account, usually based on an established formula. Free play is a reward paid via machine credits that requires me to play amount through the machine (at least once). How much cash (or free play) do you really get? I have on occasion seen it as high as 2%, meaning that the player gets two cents for every dollar wagered. And if a player is putting $1,000 through that machine every hour (active quarter player) that cashback can count up to over $100 at the end of the day. How does a casino decide how much cashback to give? Casinos with tighter machines can afford to give out more cashback. (Warning: Any casino that regularly gives out more than 1% cashback, especially on video poker, usually has very tight machines.) Also, if a property has a gourmet-level super-buffet, or frequent name entertainment, there is enough demand for comps that they do not have to give cash. It also depends on what nearby competition is doing. Almost all of the casinos on the Mississippi Gulf Coast offer cashback, but a rather isolated tribal casino may not feel the need to do so. Do all casinos give cashback? Several very successful clubs (including the Boarding Pass offered at all Station Casinos in Las Vegas as well as most casinos in Harrah’s Total Rewards) do not offer same-day cash rebates, but prefer to send cash rewards through the mail (and thus guaranteeing another player trip before disbursing the funds). Others have found that their players will remember gifts, comped meals and room offers longer than cash—which they promptly forgot after they threw it back into the machine. Comp is short for complimentary, which in the dictionary means “given for no additional fee.” (You will note that complimentary does not mean “free!” You are expected to do something to earn it.) Besides meals, rooms and entertainment, casinos will comp (to the right customer) airfare, shopping sprees, golf, spa treatments—anything that is legal! How do you get a comp? Some clubs (those that give out points while you play) make it very simple. Based on the number of points in your account, you can get this meal or that gift. In many cases, the casino either has some very handy kiosks, or a point-of-sale system at the restaurants, allowing the player to have his points redeemed right off of his card without having to visit the booth. Other clubs make the process more secretive—players have to go to the booth and see what they can get. Have players clubs changed much over the years? Yes, in several little ways (especially involving automation), but the most important changes are the creation of Megaclubs and the increase in Direct Mail Rewards, especially using free-play. My term for the new multi-property players clubs. The biggest is Harrah’s Total Rewards, but there is also Isle One (Isle of Capri), MGM Mirage Player Club (MGM-Mirage-Mandalay), and in Las Vegas the Boarding Pass (Stations). Are Megaclubs a good thing for the players? If you play in multiple casinos owned by the same company, you will probably get more benefits under a Megaclub than you would under two or three in a completely separate system. Also, if you are visiting a new jurisdiction (such as St. Louis Tunica or whatever for the first time), you may have comp privileges waiting for you at casinos you have never been to, just because they are part of the same Megaclub. Why are casinos sending out more Direct Mail Rewards? It’s effective, and due to computerization, it is cheap! Plus players respond to it very well, despecially to once-a-month packages containing various coupons and offers. What casino has the best players club? The best club for you depends on what you play, how much you play and what benefits you like. 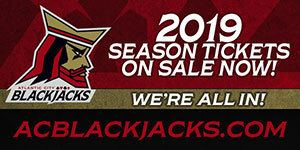 A professional video poker player would base his answer in how the club’s benefits fits in with the payback percentage of whatever video poker game he is playing. I tend to favor a club with strong meal comps. In reality, few people totally base their playing decisions based on the players club—it is just another factor (along with location, casino floor, property amenities) that a person factors into the decision.